If you are currently missing teeth and want or need a permanent solution, our world leading implant dentists at Herald Square Dental and the Denture Center in New York, can provide you with Implant Retained Dentures that are custom designed, long lasting and beautiul. All of this precision work is done meticulously, right here on our premises. Missing teeth and loose teeth can affect your “bite” as well as your ability to speak clearly and chew correctly. Also, it can increase the burden on your remiaing teeth and can cause muscle pain in your jaw and potentially cause headaches as well as obviously, affecting your appearance and confidence. The implant procedure itself is minimally invasive and cost effective since it is the most long term solution. An upper denture attached to implants will not cover your palate the way a traditional denture does, no rubbing, no sore spots, no need for adhesives. It feels as though you have your natural teeth back which is a huge boost to the quality of life and you will smile and eat and laugh with comfort and confidence. An implant supported lower denture removes the difficulty of having to use your musculature to hold in a denture since we have no palate on the lower jaw. Rather than resting on the small bony ridge that we have, the lower denture fits securely on lower implants and once again, much more like having your natural teeth back. Smile with Confidence! Call us at 212 –New York Office Phone Number 212-689-0024 to schedule your consultation with Dr. Pasch, Dr. Yam or Dr. Shirzadnia. 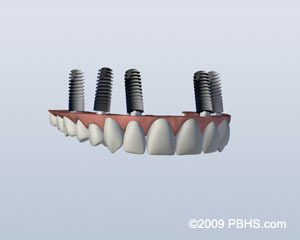 5 out of 5 stars based on 1 Implant Retained Dentures reviews. Great staff. Very comfortable and professional environment. Fantastic doctors, Dr. Shirzadnia is incredible! I would recommend him and herald square dental to anyone looking for a dentist.